I was sent a Furbliss in blue (for short haired pet) for free, in order to give honest reviews among various sites, and introduce you to the product. DrsFosterSmith.com carries these in several varieties for your furred ones. 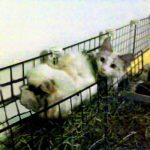 You can use them on your dogs, cats, bunnies, and possibly even guinea pigs. I can’t firmly stand by the guinea pigs, because I’m not going to handle my ladies much this week. But boy, do piggle wiggies shed! 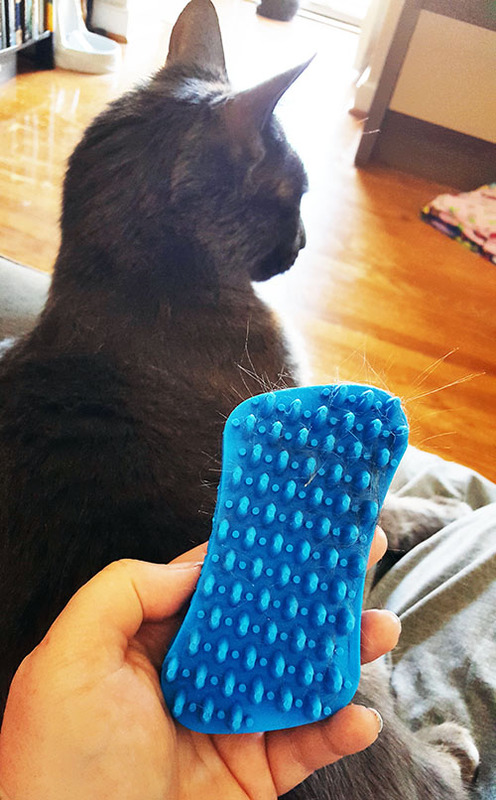 “The versatile and convenient Swiss-designed Furbliss brush provides a gentle and calming brushing action that massages your pet, leaving her in pure bliss. This 100% medical grade silicone brush de-sheds and removes sebum and dander. The back side of the Furbliss helps loosen fur and is a highly effective tool to remove fur and lint from clothing, furniture, and auto interiors. Furbliss is also the perfect brush for bath time! Simply fill the compartments with your pet’s shampoo and scrub. Once your pet is clean and dry, run the brush through her coat to leave it shiny and soft. Pet parent tested and loved by pets – this brush is simply Furbliss. Made in the USA. The Furbliss is very gentle. Tommy Gargoyle hates being brushed or de-shedded, and I just let him hold onto that attitude, because he rarely sheds anyway and I don’t know that I’ve ever seen him yack a hairball up. But, today I asked Tom to sit down with me, and I buffed his coat up well with the silicone Furbliss. He had nothing to say. No opinions to give. All he knew was that his mother was giving him affection again; it was that gentle. I still got just a tad bit of fur up after several minutes of trying on a cat that doesn’t shed. It got better. I introduced it to my cat that loves getting brushed and de-shedded. I would love to try the other uses Furbliss boasts, like assisting with bath time, but the last time Tommy got a bath was a year ago. This would have been really nice to have back when my doggy was living with me, so we could have some buddy bonding time with the tub and my Furbliss in hand to give her a gentle scrub. I did get Amalie, my tortie, to drool all over my leg though.